One weekend, three A380 First Class flights, a personal record! On my way to Canada, I flew Etihad Airways A380 First Class from London to Abu Dhabi, Qatar Airways A380 First Class from Doha to London and British Airways A380 First Class from London to Los Angeles. For the Etihad flight, I burned 40,000 American AAdvantage miles, the two other flights were part of the British Airways First Class error fare from Dubai (~€1350 out-of-pocket, a fraction of the normal fare ~€7000). The revenue OneWorld flights earned me a total of 23,429 American AAdvantage miles. 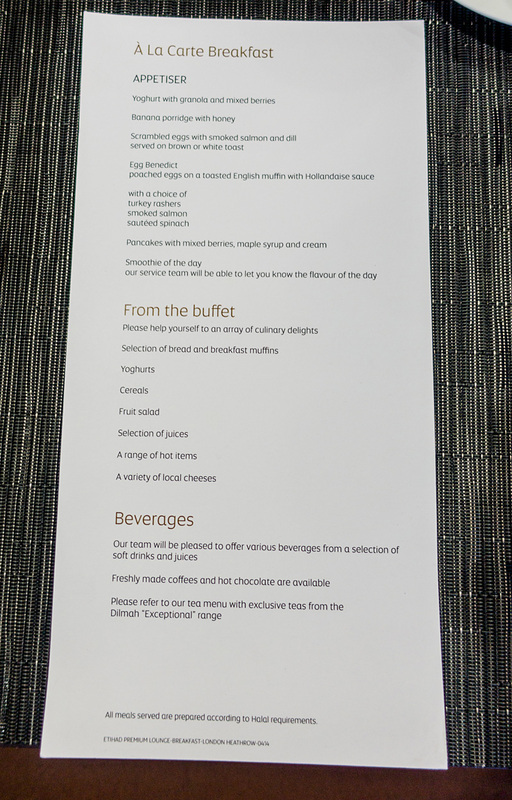 I had very high expectations for my Etihad A380 First Class Apartment flight from London to Abu Dhabi, but unfortunately those were not met. Was it because Martina was not part of the flight crew? Maybe. 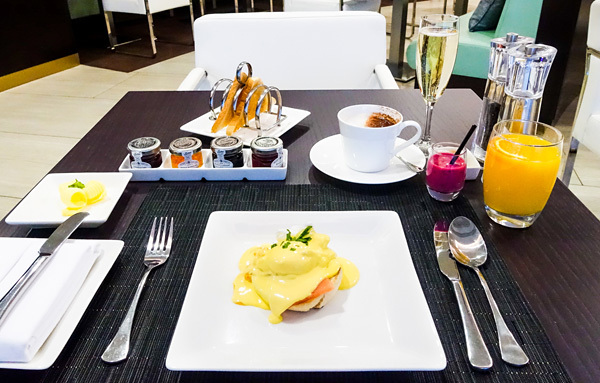 The ground experience at Heathrow was nice with a tasty breakfast (menu) and relaxing massage (Six Senses Spa) at the Etihad First & Business Class lounge. But onboard there were a number of disappointments: a less than enthusiastic welcome by cabin manager Bashar, a pre-departure drink served in a broken glass, mediocre inflight dining & service, a cramped shower, a lobby bar lacking the grandeur of its competitors, and more… All first world problems, but if you pride yourself on “setting a new standard for best in class”, expectations of your premium passengers are very high. Obviously, there were a number of positive features as well. The spacious ‘Apartment’ offering great privacy, the ottoman converting in a 2 meter bed, the huge IFE high definition screen, etc… check the Design Air Etihad A380 First Apartment trip report for more details and pictures. I’ll fly Etihad A380 First Class later this year again which hopefully will be an improved experience. Pic: Etihad First Class pre-depature drink & snacks. Upon arrival in Abu Dhabi, I had some refreshments and fantastic shave by barber Noor at the Etihad Arrivals lounge before Etihad’s Chauffeur service drove me to the Park Hyatt Dubai. Pic: Excellent service by Etihad barber Noor! Pic: Forget golf carts, this is how we role at Park Hyatt Dubai! 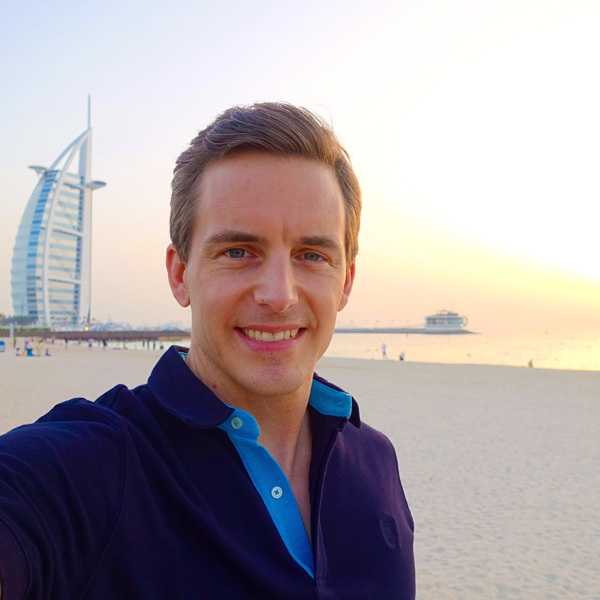 After a relaxing weekend with friends in Dubai, the journey continued with my best short-haul flight ever! Qatar Airways A320 First Class from Dubai to Doha. The service and inflight catering offered by purser Mi & colleagues during this 45 minute flight was simply amazing! Same counts for the views during take-off! A short layover at Doha airport allowed me to enjoy some breakfast and Krug at the Al Mourjan Lounge before boarding the Qatar Airways A380 to London. No private suites in this First Class cabin, but beautiful designed seats with a lovely color scheme and fantastic high quality materials. Service and inflight catering were great, only minor comment was the very slow complimentary inflight Wi-Fi. And then followed the worst First Class airline experience I ever had, British Airways A380 First from London to Los Angeles. At Heathrow Terminal 5, there was the horrible BA Concorde Room where you need to wait half an hour to use a shower which looks like a hospital bathroom, an Elemis Travel Spa which requires you to call 5 WEEKS in advance to book a 15-minute treatment and food you don’t want to even look at. Unfortunately there wasn’t much improvement after boarding the A380. The seat was ran down, cramped and had a tiny low resolution IFE screen. What made it even worse was the trash and stains from previous guests. I felt embarrassed for the purser announcing through the PA “Welcome to our brand new British Airways A380” . Service and catering wasn’t spectacular either, so I decided to sleep until our arrival in Los Angeles. Surprisingly, Qatar Airways First Class was the most enjoyable experience out of my three A380 First Class flights. Etihad wasn’t bad, but didn’t manage to blow me away. British Airways is now on my ‘avoid’ list. Both Qatar and Etihad First Class can be booked extremely cheap using miles, so if you still have some American AAdvantage or Etihad Guest miles in your account, make sure to book now before the big devaluations kick in! So glad to see another Belgian is taking advantage of AA’s frequent flyer program, which – IMHO – is the best loyalty program for EU based folks (and here’s why: http://wp.me/p4d1XU-fRC). Beautiful photos. Love your blog! I am flying Etihad’s A380 first class soon as well (same traject London-Abu Dhabi). Thanks for your feedback Xavier! These are the kinds of weekends you want to go on forever! Shame on the underwhelming First Class Apartment experience, hopefully your second one later this year will be better! Very lucky that you got AA award availability on EY during the weekend you need to fly. Normally you need to be very flexible. How about the QR first class? I will fly QR business class later this year. Is there a big difference between the classes? Should i try their first class? My wife and I have more BA miles we can use, so we try (try is the only way to discribe the experience, because even one year in advance there is often no availability on popular flights) to book first class flights. Our A 380 flight experience during flight from LHR to LAX was similar. Poor service, rude personnel, terrible food , and no WiFi. We are boarding BA to London and Malaga today, hopping this time our experience will be different. We will report after our return. I forgot to mention $$$$$ departure tax from LHR. Thank you for your input Andrzej. Maybe better to use your BA miles for partner awards. There are a number of ‘sweet spots’, check google. Enjoy your trip to Spain! Thanks for your feedback Brandon! That’s gonna be an awesome NYE trip! PH Dubai is great, just make so to leave early to Burj Khalifa on NYE to avoid getting stuck in traffic! Is the Burj Khalifa where the “party” is at for NYE? We haven’t really planned out what we’ll be doing/seeing yet! Do you have any recommendations? We’ll be arriving Dec 28 in Abu Dhabi. Staying at the Intercontinental Abu Dhabi until Dec 31st, then driving over to Dubai and staying until Jan 4th, then driving back to Abu Dhabi for 1 night at St. Regis Saadiyat Abu Dhabi, then back to NYC on Jan 5th. Hi Bart, I am flying QR J tomorrow from Europe to Asia, and have still no idea where to stack the miles. Which FFP will you recommend that allows the cheapest redemption from Europe to Asia (preferably on QR or CX) and quickest status? Many said to stack it on AA or BA, but with many changes occured recently to those programs, I still have doubts. Thanks! Hi Chris, check http://wheretocredit.com (all depends on your booking class) Note that Qatar Airways often has double / triple miles offers for its Privilege Club. Hi Bart, my booking fare is eligible for 125% for the majority of OW programs. However, I am looking for a program that is the most suitable and beneficial for me to reach status quickest and allows cheapest redemption from Europe to Asia with QR or CX. Which program would you recommend? What is interesting is that you have chosen to adjust the hue and saturation of the various photos on the first 3 parts of your journey and not during the British Airways leg. I’m assuming to make the photos even more appealing and further juxtapose your reviews? 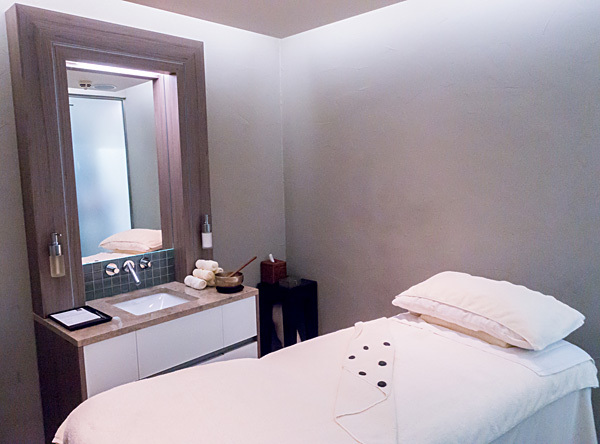 I have managed on a few occasions to book “on the day” at the Elemis spa at Heathrow T5 for a shave, and know that you can easily walk up and ask for a shower room. Also, to say that the Concorde Room is horrible, is very misinforming. This is an awesome review; loved it!